Above: Designer Lynne Shears added space with the new mezzanine level, creating a platform floor supported with steel cabling attached to an overhead beam and metal brackets anchored into the existing brick walls. Her husband, Bryan Woelfel, shakes his head and smiles when his wife says such things. But he doesn’t disagree. 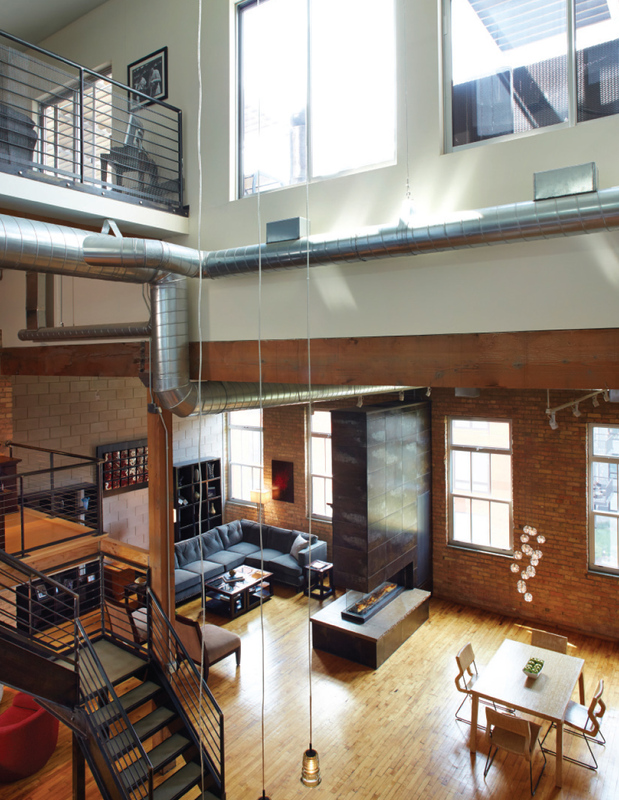 In 2009, when the couple moved into the 801 Washington Lofts in Minneapolis’s North Loop neighborhood, he assumed the place was perfect and would remain as is. 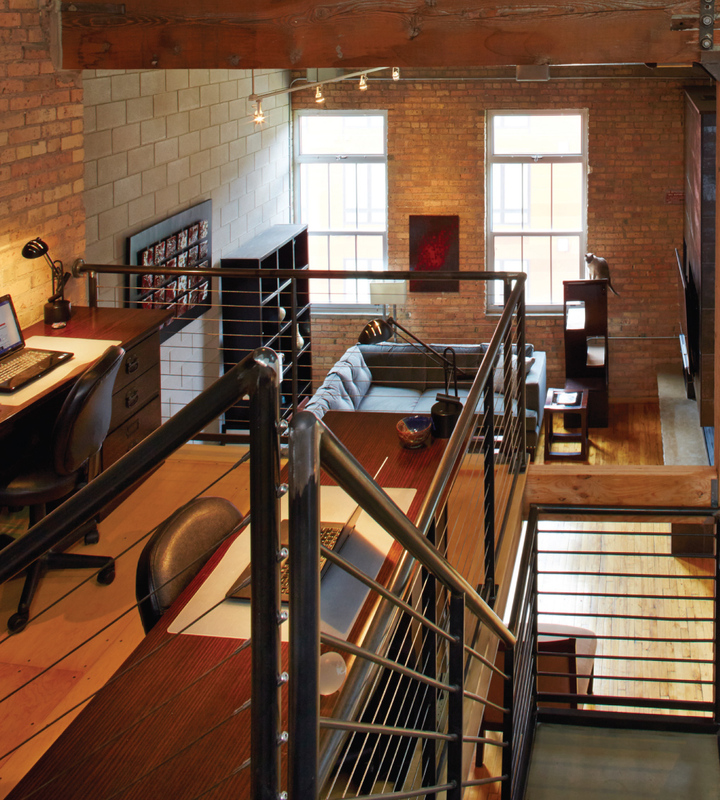 Lang also loved the three-story loft, with its 100-year-old maple floors, steel staircases with visible welds, original Chaska brick, cement block walls, exposed ductwork, and large, timber framing—but she had other plans. Left: The loft before the remodel. 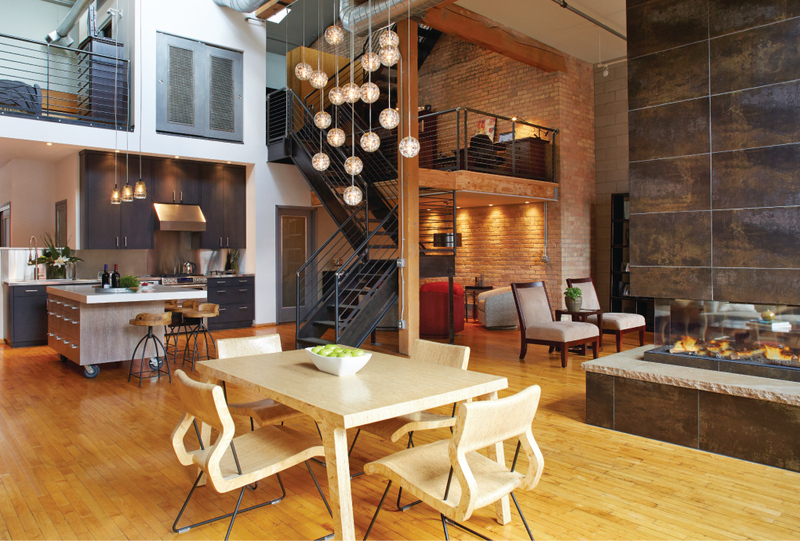 Lang and Woelfel recently completed a remodel of the former-warehouse-turned-high-end-loft, hiring interior designer Lynne Shears of White Crane Construction to help them achieve the look they desired: industrial and eclectic. “Nothing too matchy-matchy,” Lang instructed. Aesthetics weren’t the only consideration: They wanted more storage in the kitchen, office space for home-business use, and a reimagined fireplace that would provide the focal point for the main level. Above: New espresso-stained cabinetry nearly doubled the storage space in the kitchen. Shears helped the couple reshape the space visually and spatially. The enormous, floor-to-ceiling fireplace cantilevers off a wall, its inviting glassed-in flames visible from both the dining and living areas. 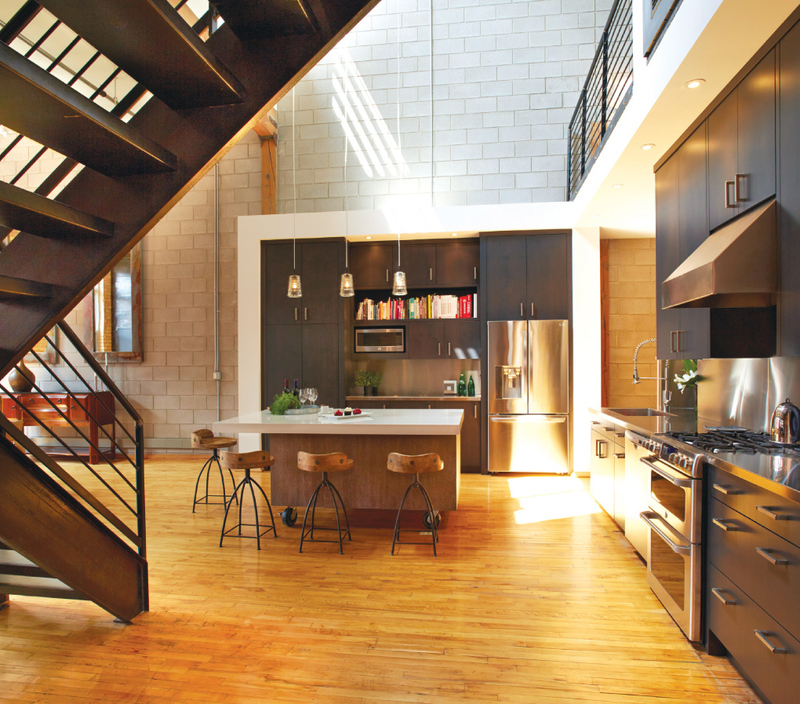 Its metallic-porcelain tile exterior exudes a modern-yet-rustic feel in keeping with the character of the loft. Like the tall, custom-made mirrors and the chandelier with handblown glass-ball pendants installed in the dining room, the fireplace creates vertical interest, preventing the space from feeling cavernous. In the kitchen, Shears nearly doubled the storage space by moving the refrigerator and adding espresso-stained alder cabinets with special compartments for cooking accoutrements, storage, recycling, and other culinary considerations. When the couple entertains, people now perch on distressed-wood stools that ring an enormous center island topped with white quartz. A small area between the kitchen and front door was transformed into an art gallery, complete with a lighted niche for a favorite piece. Above: The fireplace anchors the main floor. Left: The new mezzanine-level office features views of the main floor. But perhaps the most striking change was structural. Midway up the stairs to a lofted bedroom, an 8-by-14-foot maple-plywood platform was installed. The wall-less aerie makes a perfect office, with unobstructed views of the main floor. 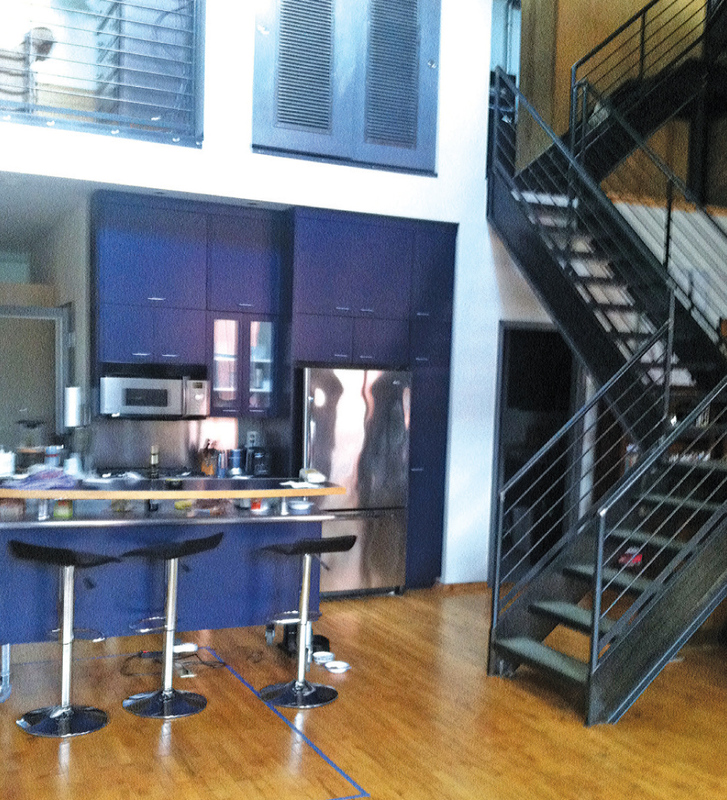 Adding the level required the relocation of a steel staircase—no small feat—but the 3-foot adjustment opened up views and flow in the room. What’s more, a new wine space was tucked underneath the platform, complete with cabinets, comfy chairs, and three temperature-controlled refrigerators.